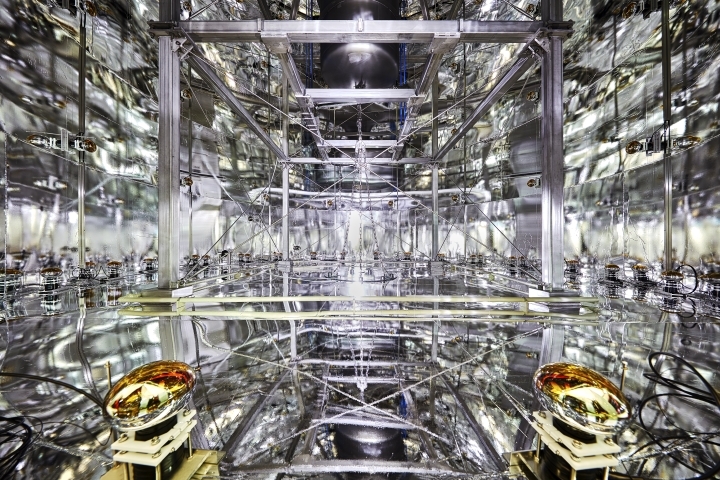 XENON1T, one of the world's most sensitive dark matter detectors. Gran Sasso Laboratory, Italy. Copyright: Enrico Sacchetti. This photo cannot be used without prior permission of the photographer. "In a spiral galaxy, the ratio of dark-to-light matter is about a factor of 10. That’s probably a good number for the ratio of our ignorance-to-knowledge. We’re out of kindergarten, but only in about third grade." In 2019 Science Gallery London will delve into one of the biggest and most profound mysteries in contemporary physics – dark matter. Scientists have been hunting this elusive matter for nearly a century, but it has never been directly observed. But theories like gravitational lensing persuade us that it exists, and could function as a kind of cosmic scaffold, holding the luminous galaxies that we see in place. We know that normal matter accounts for only 5% of the stuff that exists in the universe. In contrast, Dark Matter makes up over a quarter of the cosmos, and is invisible: unlike normal matter it doesn’t reflect or absorb light. And it is everywhere – scientists think that billions of Dark Matter particles are passing through your body every second. Extreme Scales – from the macro scale of the universe to the micro scale of the quantum world. The intrinsic nature of matter - the best theories on the behaviour of matter still reveals very little about what matter actually is. The role of maths in understanding the universe. The application and implication of AI on scientific research. Science Gallery London welcomes submissions for existing artworks, films, performances etc. as well as projects which are still at a research and development stage. Selected candidates will be granted an appropriate fee and production costs for the realisation of their project. Science Gallery London will cover all normal costs associated with exhibition making. Whenever possible, we would like for candidates to be present at the launch of the season in May 2019. Check out our tips on what makes a good open call submission here. Hi Stefano, please refer to the information about the open call found here:https://opencall.sciencegallery.com/95-universe-missing where all the themes we are interested in are listed. The seocond field is for internal use, please ignore this. Good luck. Good morning, I am trying to fill up the application form but I am not sure about the image and video upload. My project is based on sound with no visual representation. should I upload a piece of sound as video? Hi Yacopo, you can upload a piece of sound or add a link to hear it somewhere else, either works for us. Good luck. Hello George, the gallery will have some equipment including projectors and speakers for exhibition display. Depending on your requirements we may be able to use these, if you have particular / specialist requirements, it might be wise to cost an anticipated hire or purchase cost within your budget. Good evening, I would like to know if in the budget it must be included dismantling costs or the work once installed becomes the property of the London Science gallery. Hi Stefano, the work remains the property of the artist rather than Science Gallery London, so after the show the works will be deinstalled and returned to the artist. You don't need to include deinstallation costs as the gallery technical team will do this.